Since I’m on such a roll talking about both accessories and things that have been rattling around in my head since the end of 2011, I might as well continue. It has created quite the posting streak and we all know that’s for the good of the nation. I’m just glad to do my part. Totally cute right? But it reminded me of all the large feature necklaces that have been gracing celebrity necks in the last few months. There has been a serious swing away from the long-chain-with-ornament clustering to a one-piece-says-it-all kind of movement. These pieces are big, bold, and optionally bright – the majority being one part only, almost a neck “cuff”. Statement pieces like this need to speak for themselves and are best worn as the feature of your outfit, not an added extra. They almost remind me of Egyptian jewellery, as if being able to afford one giant piece of precious metal makes more of a statement than a little sparkle on a string. I’m sure Kim K wouldn’t mind being likened to a modern-day Cleopatra, and she’s been rocking the trend like a champ. 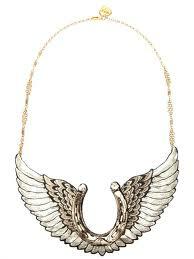 Drawing on this, I’ve also seen a few red-carpet gowns that incorporate the necklace as part of the dress. The drape from the neck draws your eye towards the piece, while highlighting its solidity – its upholding the styling while literally holding up the dress. 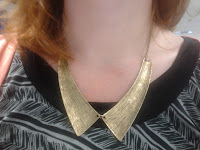 What I loved about my little Glassons purchase was the two-for-one styling of a statement necklace and feature collars. It works perfectly with this collarless shirt dress but I think it would be in its element worn over a plain black or blue high necked top. Just as you can now buy detachable collars to add the peter pan or bow-tied collar to your wardrobe favourites, this necklace adds a pop you mightn’t always require of your staple dresses and tops. It’s win-win. It’s also very wallet friendly – that is, you don’t have to go out and buy big-ticket items that are on trend, but might not be at the end of the season. Treat yourself to statement pieces that bring something new to any clothes you add them to, and you’ll find you can make up looks on half the budget. Choose your statement necklace as one solid piece or a tightly connected cluster of elements. Keep them close to the neckline so that they create a collar. And if you take nothing else away, wear them on their own. This trend is not about layering. It’s simplistic chic at its best.